Not A Beginning Knitter Anymore...: Thanksgiving Buffet! Okay, so Thanksgiving Buffet really refers more to the content of this post than to how I ate today. I was actually fairly tame... One large plate of Thanksgiving food and two slices of dessert. I do have plenty of unrelated news for the blog though, thus the "buffet" title. First and very important in blog news... For those of you who have been following the saga of the cursed square. It is DONE!!! DONE DONE DONE!!!! As in cast off the needles done. Can you tell I am freaking excited???? 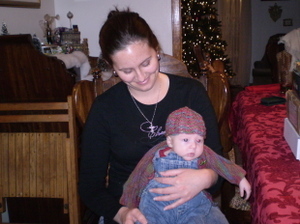 Next news on the buffet- Baby Lily wore the sweater and hat that I knit for her today at Thanksgiving dinner. I am sure she was trying to figure out why we had her all bundled up-- poor baby. As you can see from the photo, she wasn't totally entertained by modeling her outfit. However, those photos are testament to the fact that I finished TWO knitting projects. As Van Wilder would say, "write that down." Continueing on, if anyone knows someone who actually finishes at least fifty percent of their projects, can I meet them?? I am hoping it might rub off. I am currently working on the Big Easy Sweater that I started the January I began knitting (that means that bad boy has been on the needles very nearly two years). Needless to say, my gauge has changed so much (yes, I checked my gauge-- write that down) that I had to frog what was done and begin again. I am also working on the fish blanket for Miss Lily. I mean, she isn't old enough to appreciate it yet anyway, is she? Then I have all the usual suspects still on needles. Until next time!! Cheers and Happy Holidays! Hey Trish! You've just been tagged! Go to my blog to get the instructions. Trish - you are in good company with the low level finishes. But congrats on the ones you did finish! KnitPicks' VP Tina Birch said on her podcast that she only has two projects going at anytime so that she can finish them. I think that's pretty boring!! Baby Lilly! Beautiful! (both the baby and the knitting) And I am so glad you have not given up on de-fishes! I'd love to help you out with the 50%-ers, but alas, I'm not one of them. Having finished the back of my Porlock, I got 6" into the sleeves and felt an undeniable urge to cast on FairIsle mittens. What can I say, the Macy's Thanksgiving Day Parade is a powerful motivator! Congrats on the baby successes - she looks fantastic. The overalls totally make the little John Deere button perfect!